Vietnam is deservedly popular amongst holidaymakers. Amazing weather, divine scenery, delicious food and ancient cultural charms mix together to create a truly unforgettable destination. If you’re considering a holiday to Vietnam, 2017 is the perfect time to go. There’s good tourist infrastructure but still plenty of sights off the beaten track to for a real Vietnamese experience. Here are six of the best reasons to visit Vietnam this year. Vietnam’s most popular tourist attraction is still utterly spectacular in 2017. Junk boats float leisurely across this turquoise expanse and vegetation-covered limestone towers rise out of the water. It’s breath-taking – there really is no other word. For the ultimate experience you should enjoy a cruise trip out on the bay, ideally on a boat you can sleep on. There are plenty of islands and islets across the bay that hold treasures including sandy beaches, dense forests and caves. Don’t miss Cat Ba, the largest island, half of which is covered by a National Park that is home to the endangered Cat Ba langur. A pretty beach resort that has seen plenty of renovations in recent years, Nha Trang might be Southeast Asia’s most underappreciated holiday destination. Diving, snorkelling and other watersports are extremely popular thanks to the favourable conditions in the water. The arch of charming beach backs onto a lively promenade with as seemingly endless array of restaurants and boutiques. And a jaw-dropping backdrop is supplied the picturesque Co Tien Mountain, which intrepid travellers can climb. There really is something here for everyone. The South of Vietnam is the home of the Mekong Delta, where the Mekong River meets the sea. This is the ideal place to set off on a cruise along the Mekong. This iconic river flows through many of the important towns, including My Tho, Cai Be and Chau Doc where you can find floating markets, charming temples and more. Cruising options range from small, basic boats to larger cruisers with amenities like air-conditioning. Be aware that as you pass through rural areas and get closer to Cambodia there is a great risk of issues such as malaria and Japanese encephalitis. It’s always best to consult a specialist clinic about the kind of vaccinations for Vietnam you may need. In between Ho Chi Minh City (Saigon) and Dalat, Cat Tien National Park consists of lowland tropical forests. It’s a great place to see an incredible diverse array of wildlife including Siamese crocodiles, eagles and families of the rare golden-cheeked gibbon. Hikers and birdwatchers will be in their element here, and if you’re especially lucky you might even catch a glimpse of an Asian elephant or an Asiatic black bear. Ho Chi Minh City has a range of attractions including the fascinating War Remnants Museum, Notre Dame Cathedral and a variety of pretty pagodas. But a trip to the city would not be complete without a tour of the Cu Chi Tunnels. This vast network of underground passages that served as the base for the Viet Cong during the Vietnam War. You can wander through the tunnels and visit preserved conference rooms where the resistance was planned. Hoi An is a beautiful city on the central coast. The city has existed for more than 2,000 years and features well-preserved examples of Vietnamese architecture. With virtually no traffic, this graceful city retains a peaceful ambiance. 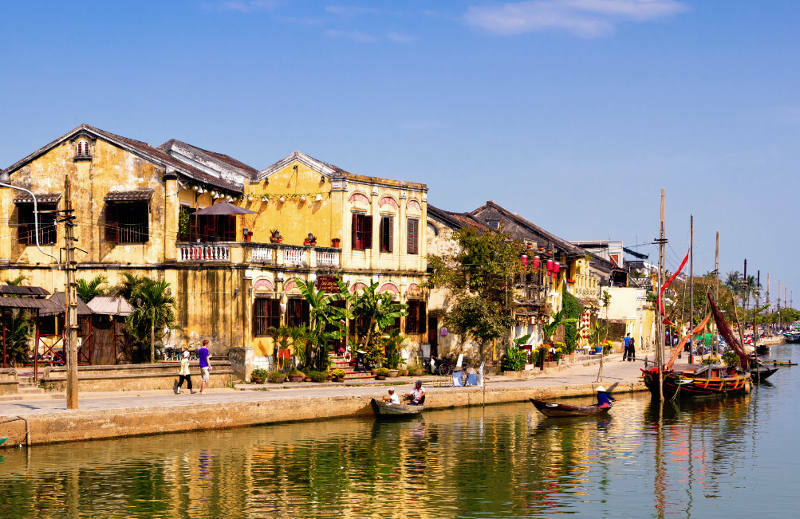 Navigate the winding streets of the Old Town for a taste of the real Vietnam. This part of the city is listed as a UNESCO World Heritage Site and there are a number of famous sites including the Japanese Covered Bridge and the Quan Cong Temple, as well as museums dedicated to Folk Culture and Trade Ceramics. The city is also renowned for its range of tailors – if you’re staying for a few days and are interested in picking up a high quality tailor-made suit, the prices are fantastic. Previous post The Latest Restrictions on Flying With Laptops and Tablets Next post Rabies in India: Why is it still not eradicated?